As the Economist points out, Gore lost an election in 2000 that never should have been close. Yes, he won the popular vote and the electoral vote was gamed by synthetic gangs in Florida, insecure voting machines everywhere, and a very questionable Supreme Court decision. Still, he was the incumbent vice president to a president whose poll ratings while he was being impeached beat Reagan's; their administration delivered "eight years of peace and prosperity" while his opponent was "an inexperienced scamp who could not name the president of Pakistan". 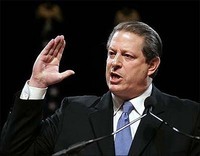 But Mr Gore sighed his way through the first debate and painted himself orange in the third. Would an electorate not used to making decisions by emotional reactions to television have let a reaction to a few minutes on the tube sabotage the election of the most qualified candidate? Last year, months before a presidential election, a law raced through Congress confirming the country's longstanding television duopoly. One broadcaster, Televisa, controls some 70% of the market. Another, TV Azteca, has most of the rest. Together the two take in 95% of television advertising revenue. Generous state funding of elections funnels tens of millions of dollars to the two broadcasters. The law was approved in “a climate of pressure” from the broadcasters, says Santiago Creel, who now heads the PAN in the Senate. Even so, 47 of the 128 Senators voted against what was promptly dubbed the “Televisa Law”. Led by Mr Corral, the 47 filed a motion of unconstitutionality with the Supreme Court. Apparently a duopoly of broadcasters pressuring government to pass questionable laws that maintain the duopoly that carries much election "news" is a problem in Mexico, but no worries about that sort of thing for the U.S.? Why? Because U.S. media are owned by five companies instead of two? These stories are from the 2 June 2007 issue of the Economist. I used to read the Economist cover to cover each issue. Nowadays I'm woefully behind, because much of what it covers is available more quickly, with more variety, and often more depth (including many relevant the source documents) online. Sometimes I wonder if the Economist has anyone left who understands the Internet since Chris Anderson left to become editor of Wired and to write influential books about the Internet. I wonder if the Economist is finding other readers are having a similar reaction, and thus might have motive for saying Gore is overreacting about old media such as television. At least the Economist puts most of its stories online where I can quote them easily. What does Al Gore say about the Internet in his book? But the Internet must be developed and protected, in the same way we develop and protect markets--through the establishment of fair rules of engagement and the exercise of the rule of law. The same ferocity that our Founders devoted to protect the freedom and independence of the press is now appropriate for our defense of the freedom of the Internet. The stakes are the same: the survival of our Republic. We can pretend, as the Internet ISP duopoly does, that there's nothing wrong now. Or we can pretend that the Internet doesn't matter, as much of the pre-existing media tries to do. Or we can consider that maybe this time, as so many times before; maybe Al Gore is right. it is a goal we seek together. Television and video have their uses, and few people ever really decide anything without their heart and their gut in it. Yet without reason we are likely to make big expensive mistakes that threaten our security and our liberties. With reasoned discourse, increasingly carried through the Internet, we are more likely to be right.